New book, 52 pages. 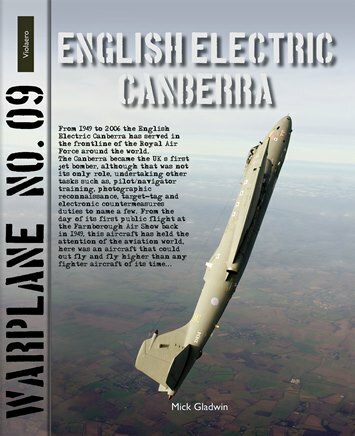 From 1949 to 2006 the English Electric Canberra has served in the frontline of the Royal Air Force around the world. The Canberra became the UK’s first jet bomber, although that was not its only role, undertaking other tasks such as, pilot/navigator training, photographic reconnaissance, target-tug and electronic countermeasures duties to name a few. From the day of its first public flight at the Farnborough Air Show back in 1949, this aircraft has held the attention of the aviation world, here was an aircraft that could out fly and fly higher than any fighter aircraft of its time. From that first flight the Canberra amazed other Air Forces around the world, one being the USA, who went on to produced over 400 aircraft under license as the Martin B-57, covering sixteen variants the last being the WB-57F which there are still three flying today in the 21st century. The Australians also went on to build over forty aircraft under license as the B.20, and there were a further thirteen other countries who purchased the aircraft directly from UK manufacturers. In all over 900 airframes were built in the UK for the Royal Air Force, not only by English Electric, but also by, Avon, Handley-Page and Shorts Brothers. There were also to be over ten major modifications to the Canberra, this gave it a new lease of life and extended its service career in both the Royal Air Force and the Royal Navy Fleet Air Arm. The story of the Canberra came to a close for the RAF on the 22nd June 2006 when the last remaining Canberra PR.9s retiring from service life after returning from operational duties. The author had the honor to serve with them in their twilight days of their careers. However, the Canberra story has not fully ended in the UK, XH134 a Canberra PR.9, now owned privately, flies displays across the UK and is the only airworthy PR.9 in the world. The 'Queen of the skies' lives on.